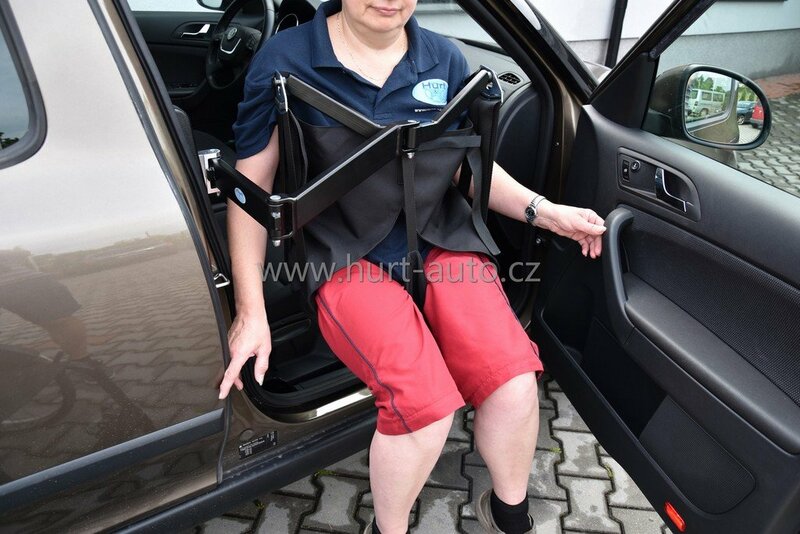 Lifting device HURT LIFT P helps assistants to transfer handicapped person inside the vehicle. 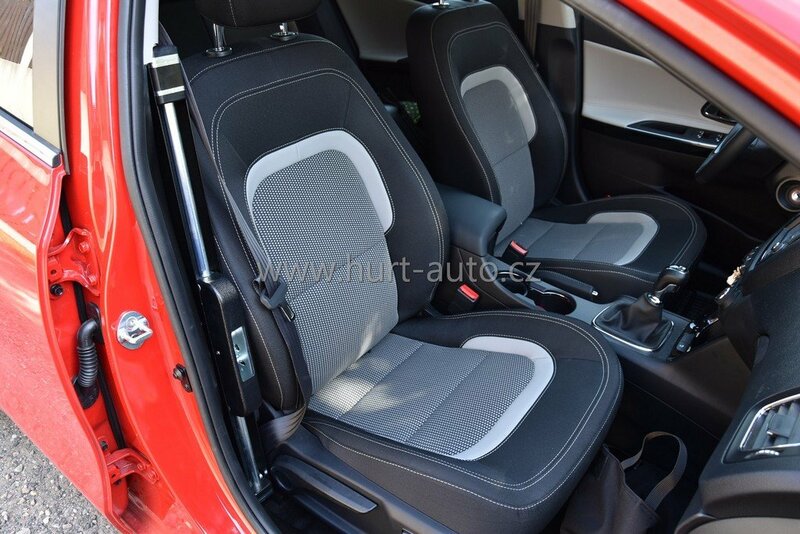 We recommend it especially to quadriplegics with larger disability or muscular dysfunction who have problems to get inside the car even with help of accompanying persons. The loader can be used to load both the front and rear seats on both sides of the vehicle. 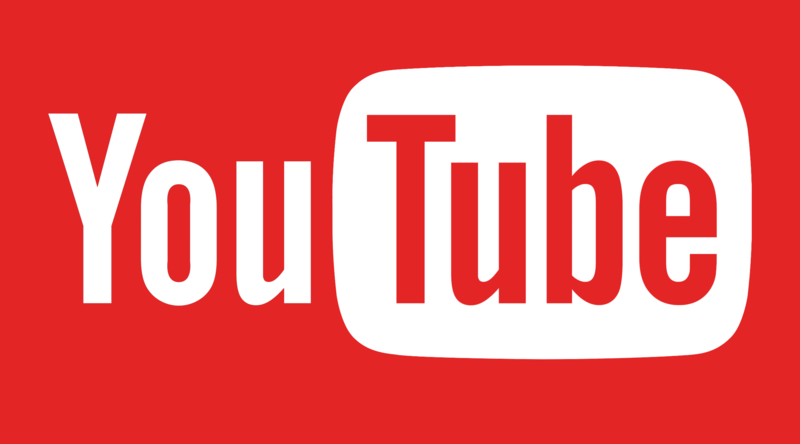 It is a completely revolutionary solution of our own production. The device consists of a lifting mechanism, an arm with joints and a special sling which we prepare made-to-measure for particular user. 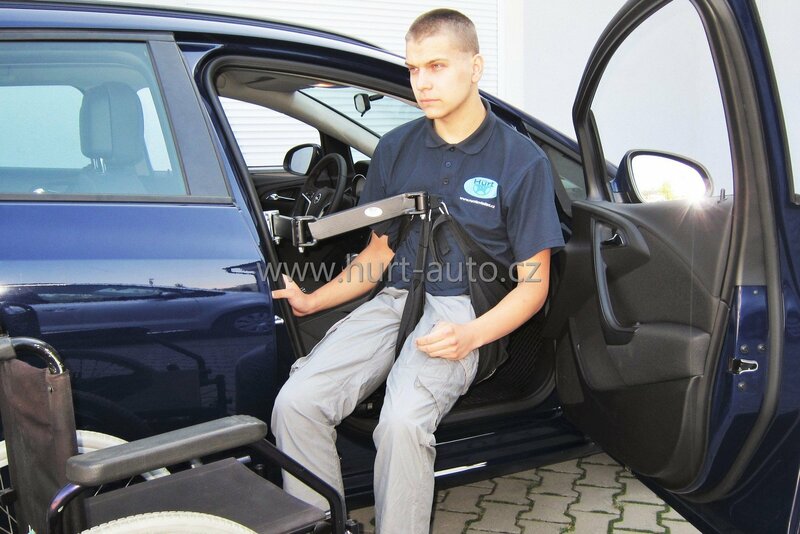 We have developed an innovative mechanism that you use to move the person from the wheelchair to the car. Thanks to its small thickness, the device can be attached to the central pillar of the car´s body. We will of course help you to learn how to use our HURT LIFT P lift up device. The device is certified by an authorized TÜV center and homologated by the Ministry of Transport of The Czech Republic. We are the only one who offers such a device. Because it has undergone our development, you will not find it even with world competitors. Write to us, we will offer you a free price. The unit has load capacity of up to 120 kg. The loader can be used to load both the front and rear seats on both sides of the vehicle. There is nothing to obstruct the legs of the loaded person, as in the case of the front-mounted lifters. The basic shape of the sling is made on the basis of long-term customer experience. We have several types of slings. We can customize the sling for the user. 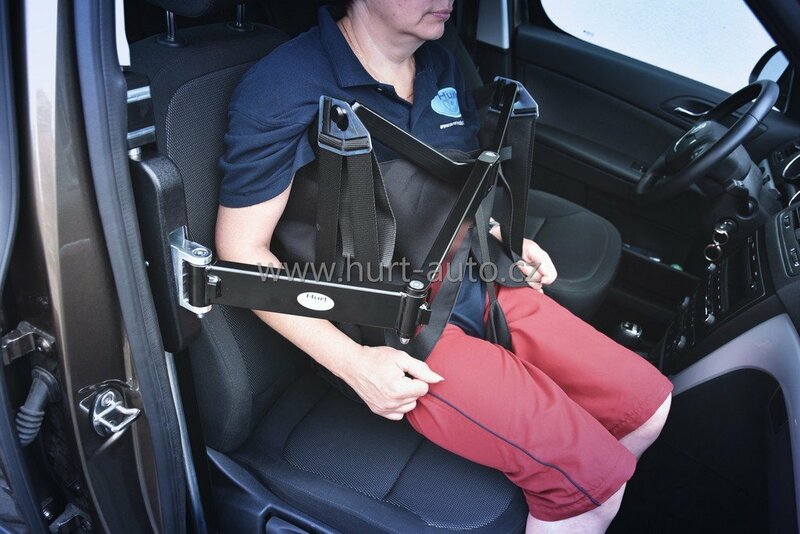 Lightly extendable, lightweight arm with joints for easy handling of the person. The lifting device is suitable for every car (passenger, van). Choice of stroke length and heights of the entire mechanism (longer stroke for vans). Choice of the controller - a button on the plastic or cable controller. Assembly is possible only by trained companies or companies with similar assembly experience. We would like to find new representatives in all countries of the world where we do not have representatives yet. If you are interested to cooperate, please let us know. Our device is suitable for any vehicle and we install it for you at our workshop in few days or we can send a kit for installer companies. The engine with the helix and gearbox is hidden under the cover. The advantage of our device is its small thickness so it fits between the seat and body pillar. 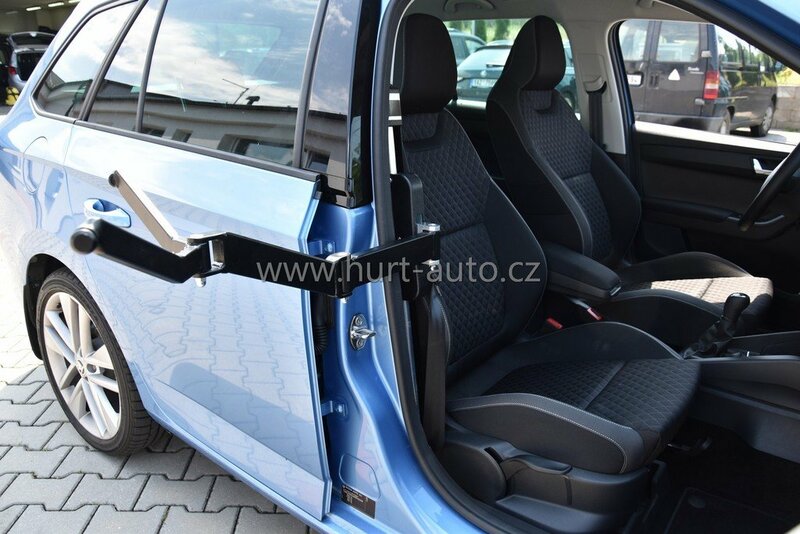 In this way, we can also adapt the device to load a person on the rear seat on suitable vehicle types. You can also choose how to control your device. Most often we place the switch on plastic in the interior or on the door. Control can also be via the wired controller.